Clearly, umbrellas have become fashionable in Cuba once more. Until recently, despite a climate in which the strong sun’s rays and rain are everyday occurrences, people seldom protected themselves from the intense heat, the winter drizzles or the torrential summer downpours. Many Cubans preferred raincoats for stormy weathers and cheerfully defied the drizzles and the dangerous solar radiation. Umbrellas practically disappeared along with hats, used only by elders, and if a young man or woman dared to use either, their contemporaries regarded them as weirdos. Today, however, women especially have taken up the tradition of their 19th-century peers, who, whatever their class background, dared not go out without the essential parasol. Ornamented with lace and ribbons, and deftly handled by the ladies, the parasol was an accessory of refinement that complemented and enhanced their outfit perfectly. Meanwhile, the severe black umbrella was a symbol of respectability for the men. Its use was so widespread that even etiquette manuals included rules of behavior regarding umbrellas and parasols. Now, the perceptible climate change has brought out caps, broad brimmed hats, straw hats, and with them, the forgotten umbrella. It would not be a bad idea to dust off these manuals to avoid collisions between umbrellas in the narrow sidewalks of some Havana streets. 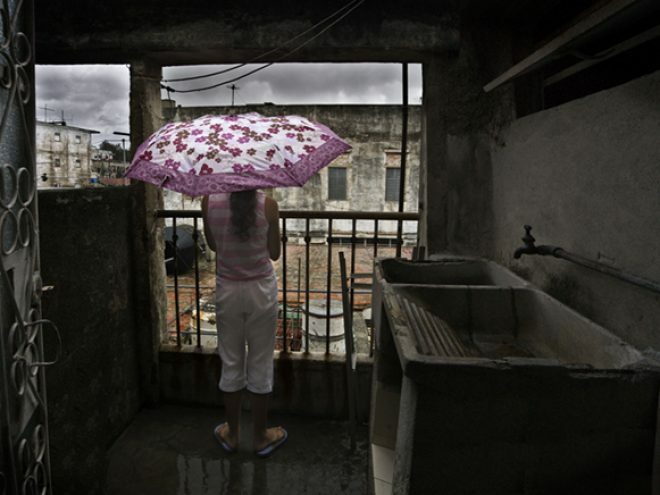 Parasols, of course, have been long out of fashion, but Cuban women use the traditional rain umbrella as sunshades. Men too have grown accustomed to its use, and it is not uncommon to see young men in casual clothes or elegant gentlemen wielding umbrellas to protect themselves from the rain—the umbrella as sunshade is still exclusive to women, as if the sun’s rays only affected them and not the men as well. Little girls—not boys, mind you—are also using smaller-sized umbrellas and take them to school along with their backpack. White umbrellas are highly sought after by those whose religious practices prevent them from wearing other colors for a certain period of time. I myself prefer to tote an umbrella instead of wearing a heavy, hot and uncomfortable raincoat, which I use only on very rainy and windy days, lest I go flying off with it like a painting by Marc Chagall. I prefer to buy my umbrellas from the Arte en Casa Collection, which has beautiful fine art umbrellas whose designs are inspired by paintings of famous Cuban artists. The collection includes prints for all tastes. Conservatives usually choose classics such as Víctor Manuel’s Gitana tropical or a cityscape by René Portocarrero. The more daring prefer umbrellas that feature works by the younger generations of Cuban artists, like mine, which reproduces a painting by Luis Enrique Camejo. These museum art umbrellas have become so popular that when it rains or when the sun is practically unbearable, Cuban streets become open galleries.